Teotihuacan, also called the “City of the Gods”, is one of the most exquisite archaeological sites that can be found in Mexico. It is also a UNESCO World Heritage Centre. The ancient city ruins are located just 30 miles northeast of the capital, Mexico City. Like other Mexican ruins, Teotihuacan is quite fascinating. 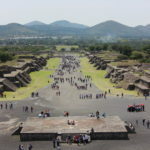 In fact, Archaeology scholars believe that Teotihuacan is one of the most important archaeological sites, not only in Mexico, but in the entire world. In the Americas, it was the largest city during the height of its civilization, which was around 500 AD. Although Teotihuacan’s aged walls have a lot of tales to tell, most of them are still unknown to the modern world. Even the origins of the city is not absolutely clear. Historians surmise that the inhabitants were from the Valley of Mexico, who had to leave their region due to the eruption of the Xitle volcano. Teotihuacan’s history can be traced back all the way to the first two centuries BC, the period of its construction. 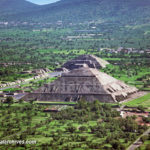 There are many mysteries surrounding Teotihuacan, and one that you will most likely hear about during your visit is the sudden disappearance of the ancient city’s vast population, which happened not leaving any trace. It is also believed that the population believed in human sacrifices to appease the gods. 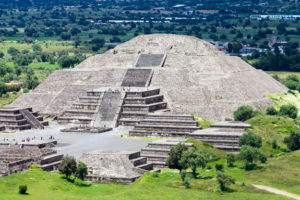 During your visit to Teotihuacan, you will get to see a place where the ritual was performed. The main attractions of the whole complex are connected by the Avenue of the Dead or Calzada de los Muertos. Teotihuacan is home to two prominent pyramids, the Pyramid of the Sun and the Pyramid of the Moon. These two pyramids are said to contain powerful energy. This belief is so strong that even today, there are people who climb to the top of these pyramids to meditate. But even if you are not the meditating kind, do not pass up the chance to check out these magnificent structures. In fact, you should begin you exploration at the Pyramid of the Sun, which is the highest structure in the city, and the third largest of its kind in the world. To reach the top, you will need to climb 243 steps, but itís worth the effort as you will get a great view of the ancient ruins, and truly appreciate how the pyramid is constructed. Legend says that you can even make a wish on top of this pyramid so give it a try! The counterpart of the Pyramid of the Sun, is the Pyramid of the Moon, which proudly stands at the northern end of the complex. Other structures at the site worth experiencing include Palacio de Quetzapapalotl (Palace of the Quetza Butterfly), El Palacio de los Jaguares (Palace of Jaguars), and the Palacio de Tepantitla.Another notable site is the La Ciudadela (The Citadel), which is the big square area at the southern end of the city. If you walk inside it, you will find the Templo de Quetzalcoatl, and other temples. Aside from touring the ancient structures in Teotihuacan; there are also other things that you can do while here. One is watching the Papantla Flyers’ performance. This group of men in traditional Indian costume use a tall pole to perform a flute number coupled with acrobatic moves. They regularly entertain visitors several times every day. 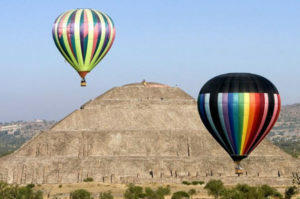 Another way to experience Teotihuacan is to go for a hot air balloon ride from San Francisco Mazapa. Traveling by baloon will treat you to the incredible panorama of the Teotihuacan valley, not to mention an amazing bird’s eye view of the pyramids. For a map of Mexico, Click Here.